Names: The name Sambucus is derived from the Greek sambuca, which was a stringed instrument supposed to have been made from elder wood. Racemosa refers to the elongated inflorescences, called racemes. It is thought the name elder comes the Anglo-saxon ‘auld,’ ‘aeld’ or ‘eller’, meaning fire, because the hollow stems were used as bellows to blow air into the center of a fire. Our Red Elderberry has also been known as S. callicarpa (callicarpa=beautiful fruit). Some identify our local plants as S. racemosa ssp. pubens var. arborescens; (pubens because of the downy pubescence beneath the leaves, and arborescens because of its tree-like form.) 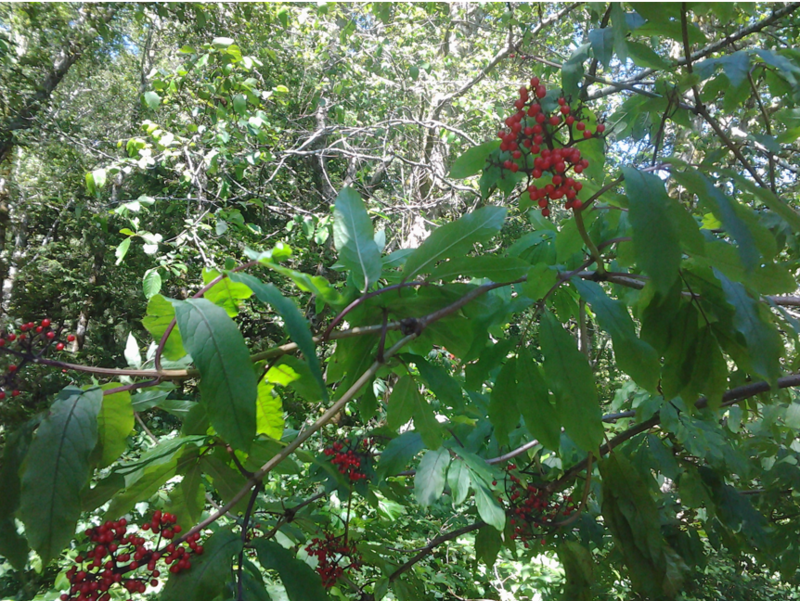 It also may be called Mountain Red Elderberry, Scarlet Elder or Elderberry, Racemed Elder, or Bunchberry Elder. A purplish-black-berried form, Rocky Mountain Elderberry, S. racemosa var. melanocarpa is also found through much of the west. Relationships: Sambucus is a genus with 5-30 species depending on how they are “lumped” or divided. Most are native to the northern hemisphere with a few in Australia (and neighboring islands), and South America. Blue Elderberry, American Elderberry, and Red Elderberry, are the only Elder species native to the United States (other named species are now lumped into these species). 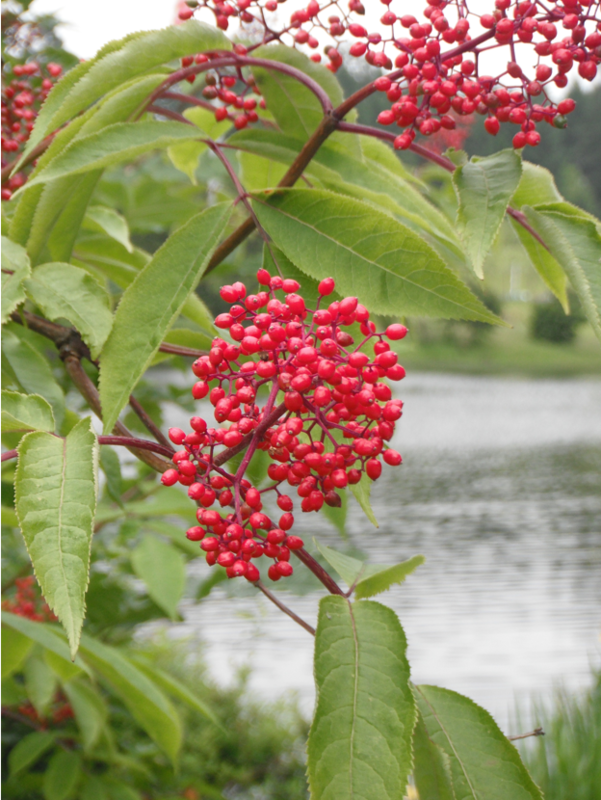 Distribution: Red Elderberry is native to Europe, temperate Asia, and North America. 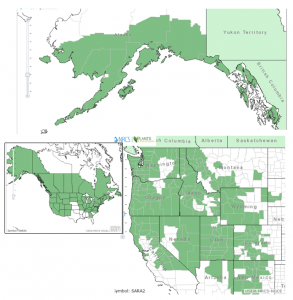 It is found throughout most of the United States and Canada, excluding only the far north of Canada and Alaska, and the central and southern United States. 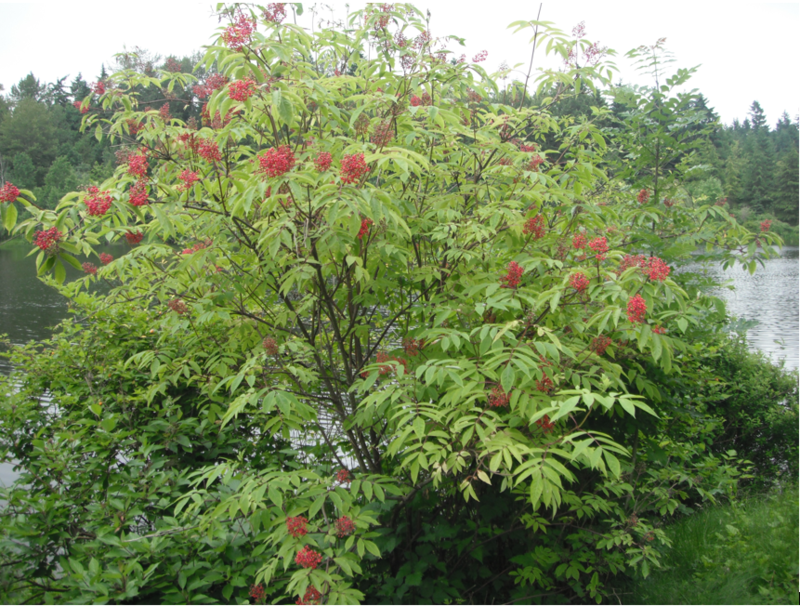 Growth: Red Elderberry grows 3-9 feet (1-6m); often tree-like in our region. Habitat: It grows in moist sites; shady or open forests, streambanks, and moist clearings. Wetland designation: FACU, it usually occurs in non-wetlands but occasionally is found in wetlands. Diagnostic Characters: Leaves are opposite, pinnately divided into 5-7 leaflets. Leaflets are lance-shaped, toothed on the margins, and often somewhat hairy underneath. Tiny, white to creamy flowers are borne in pyramidal clusters. Berries are usually bright red, sometimes purplish-black, or rarely yellow or white. Stems are soft, and pithy. 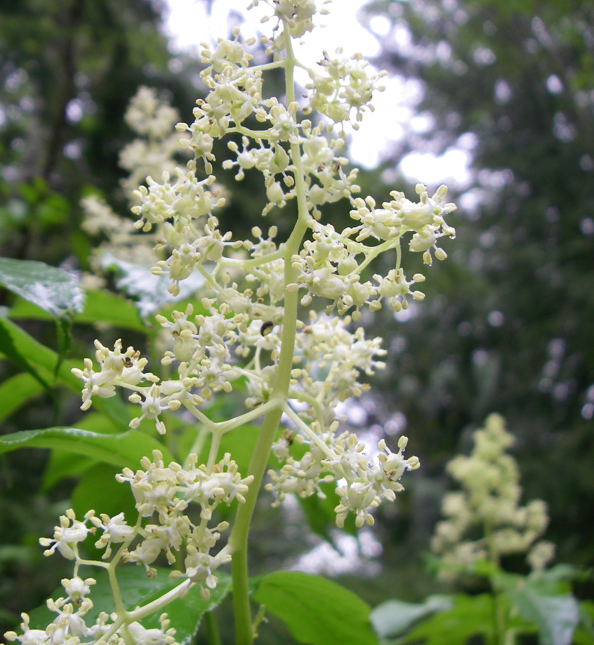 The foliage, branches, and flowers have an unpleasant odor when crushed. 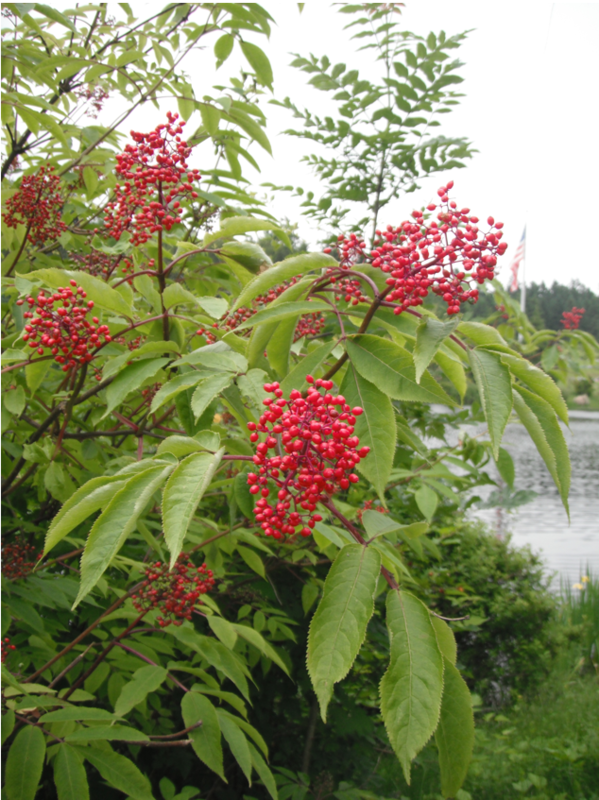 In the Landscape: Red Elderberry is especially attractive in woodland gardens. Its vase-like, arborescent form creates an umbrella-like canopy over smaller woodland shrubs. 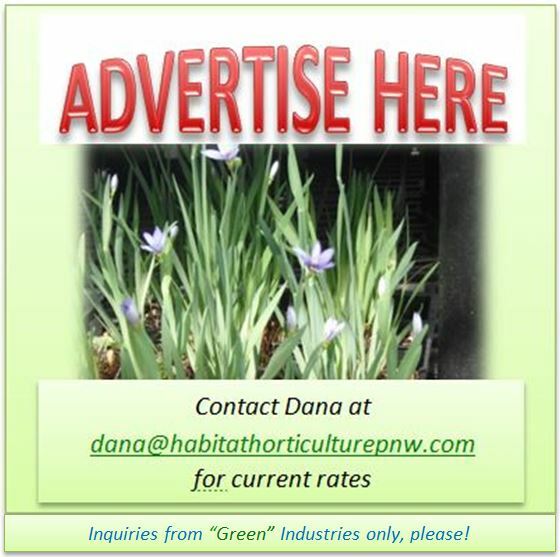 Overgrown plants can be severely pruned. 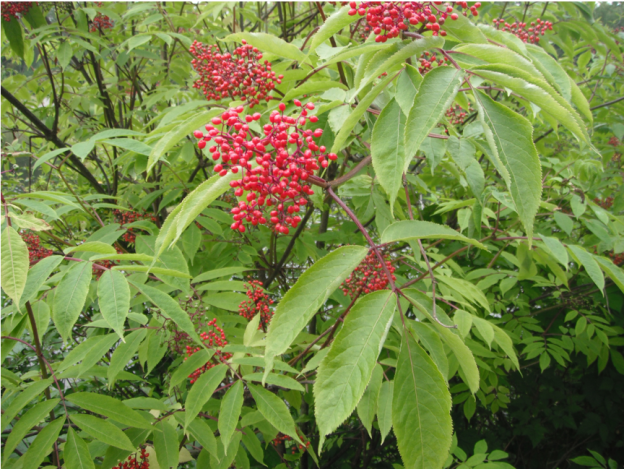 Red Elderberry is used for revegetation, erosion control, and wildlife plantings. It may be relatively tolerant of heavy metal contamination, so may be useful in restoring habitats around mining and smelting sites. Phenology: Bloom time: April-July; Fruit ripens: July-August. Propagation: Stratify seeds warm for 90 days, then stratify for 90 days at 40ºF (4ºC), or sow as soon as seeds are ripe in a cold frame. Scarification may speed up or increase germination rates. Heat from a fire can crack the hard seed coat, and it has been shown that seeds have faster and higher germination rates after passing through the digestive tract of birds or bears. Light may also improve germination rates. Seeds may require 2 years to germinate. Cuttings of half-ripe wood may be taken in July or August; cuttings of mature wood of the current season’s growth in late fall. Suckers may be divided and dug in the dormant season. Use by people: Natives steamed the berries on rocks and put them in a container stored underground or in water, eating them later in winter. Leaves, bark or roots were applied externally to abscesses, aching muscles, or sore joints. Roots or bark were chewed or made into a tea to induce vomiting or as a laxative. Flowers were boiled down to treat coughs and colds. Hollow stems were used for whistles, pipes and toy blowguns. Although they have sometimes been eaten fresh, it is advisable to always cook the berries before eating, raw berries may cause nausea. The seeds are considered poisonous. Cooked berries can be made into wines, sauces or jellies. Use by wildlife: Old Skykomish chiefs reportedly ordered people not to burn brush where Red Elderberries grew because the deer ate the ripe berries. 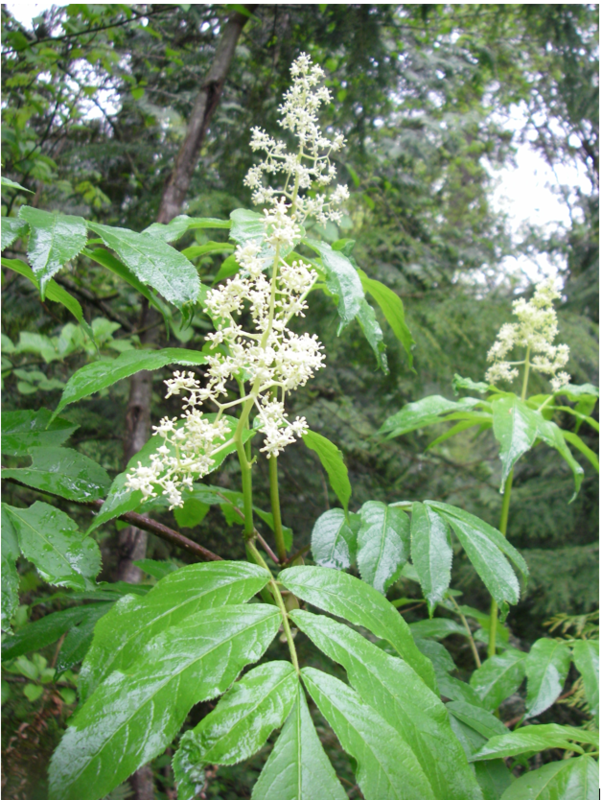 Deer and elk will eat the foliage, bark and buds, but Red Elderberry is usually not a preferred browse; palatability increases after frost and probably varies with relative cyanide content of individual plants. Many birds eat the berries including thrushes, robins, grouse, and pigeons. Squirrels, mice, raccoons, and bears also eat the fruit. Bears will also eat the foliage and the roots. Porcupines, mice and hares eat the buds and bark in winter. Flowers are pollinated by bees, flies, and the wind. Fruit-eating birds and mammals disperse the seeds. This entry was posted in Deciduous Shrubs & Vines on March 20, 2017 by habitatdana.